Before styles were named from people or mythical creatures, locality was one of the few designations for martial categories. Since all Kung Fu was originally just Kung Fu people would distinguish methods by such names as “Wei Boxing” or “Ji Boxing”: that is, where method originated. Mountains (shan) were particularly important and there are a number of them famous for spawning Kung Fu styles. These include: Song Shan (Shaolin Styles), Er Mei Shan, Tian Shan, Kun Lun region, Wu Dang region, Tian (Heaven) Shan and Hua Shan. Hua Mountain style is also typical in that among older Kung Fu styles it can be a specific and a generic name. The Hua style originally was a number of methods all centered around the region itself. From there it spread out and eventually became named as a specific style: HUA Boxing. Hua Shan is about 75 miles from Xi An, the site of the famous terra-cotta soldiers. It is known to be relatively inaccessible and even today people sometimes trudge its thousands of steps to reach the peaks. Hua Shan has for many centuries been a retreat for Taoist studies. Legend has it that the monks went through similar experiences as did the monks of Shaolin. That is they found the isolation and meditation great for their spirits but bad for their bodies. Hearing about the Shaolin method of retaining vitality they dispatched their own members who, over a period of time, came back with the skills of Shaolin. Then, through the centuries, these were melded with other Kung Fu skills and Taoist theories to create the multiple styles practiced among the mountains. The next phase of the story starts with a Hua Shan practitioner named Cai Mao. During the Tang Dynasty, Kai Yuan period (713-741), he is said to have killed an enemy from a noble family in Chang An. He fled and hid in Shang Dong Province, Ji Ning (then called Ren Cheng). His hiding was effective because 400 years later we find his descendants, Cai Tai and Cai Gang, competing in prefect wide and national tourneys. They developed their inheritance into a style they named HUA Boxing. In the Ming Dynasty, Jia Qing period (1522-1566) another Cai, personal name Wan Zhi, capped the finishing touches to the style and even wrote a book, Secrets of Hua Boxing. Next, in 1877 was born Cai Gui Qin at the village Cai Xing in ji Ning. Originally learning the arts from his grandfather, he was forced by economic pressures to move to Ji Ning outside its southern gate. There he had the luck to meet the famous Ding Yu Shan, another master of Shan Dong based HUA Quan. Cai studied with Ding for three years, consolidated his knowledge and became the HUA master during his generation. In 1897 Cai Gui Qin started traveling throughout southern China. In Zhe Jiang Province he met a Shao Xing woman, Qiu jin, who was a revolutionary (1906). Years later he met another revolutionary, Dr. Sun Yet Sen (1920). He was dispatched to teach governmental officers at HQ in the then Republic of Guang Zhou. After Sun’s death Cai was traveling again, this time to end in Shang Hai where he stayed the remainder of this life. HUA Quan had a huge boxing repertoire with many hand and weapons sets and a strong emphasis on partner sets. It’s movements are really quite beautiful and it is a true “Long Arm” style. The old saying is that if you know the complete HUA Boxing you can “go anywhere under Heaven”, a theory apparently tested by Cai Gui Qin. Among its attributes HUA style is also said to have Five Animals but different form Shaolin. They are: Tiger, Dragon, Leopard, Monkey and Eagle. The word Hua means “glorious” but is also a synonymous for China itself. Because Hua is one of the reference Long Fist styles for Contemporary Wushu it is difficult to see Hua Quan that does not look “modernized”. Here’s what seems to be a beginning set from the traditional system. The following is a translation from the Wu Shu Records of the famous Cang County, home of many great martial practitioners. This tells one story of a Cang resident and how he came to learn the Hua Shan style. Hua Mountain Boxing, is one of China’s five big WuShu mainstays. From early it was said that Shaolin, Wu Dang, Hua Shan, E Mei, Kun Lun produced the gold of China’s Wu Shu. Hua Shan, the western great mountain Hua, is a place for many who give up common earthly life and retire to cultivate their moral character. They spend many years practicing the art of integrating their temperaments and cultivate their bodies. They practice for many years, the integrated system of discipline, health and self defense called Hua Shan Boxing that has made the Hua region famous. According to legend, in ancient times there was a Tao Shi (Taoist leader), with a religious name of Hui Zhi (Wisdom), who in his later years left Hua Shan to wander everywhere under Heaven. He knew, by way of a younger sister, her husband’s family by the name of Chen. He learned that his little sister had a son, and was pleasantly surprised, to see that his nephew was clever, quick witted and knew the rules of propriety. He taught his skills to the seven year old. Living just outside the city gate in Qing County (now Qing Zhou township), Zhou Yong Liang – also called Zhou Xiao Long – practiced martial arts continuously from 8 years of age. In 1974 , at 16, he was employed at Cang Zhou fertilizer factory as a temporary worker, looking after the in-plant railway station commodities. Early each and after work, he spent his time in hard practice. At that time, there at the fertilizer factory, was a man engaged in an assignment for China Chemical Engineering Head Office #13. This construction company’s senior worker Chen Feng Qi, was stationed in a temporary shed very near where Zhou would practice. He would usually watch Zhou doing martial arts. Then one day, Chen smiling at Zhou ,said, “Your practice really has some problems.” Zhou realized Chen was an expert and addressed him as “teacher”, desiring Chen to start teaching him skills immediately. Still smiling, Chen refused. He claimed not to understand the fine details of the art. Zhou, however, kept asking for more instruction. Each day, Chen and his wife had lunch together, the Chen home attracting many workers from the operation. When the building assignment was completed there was a celebration, and Zhou presented Chen with a gift. But, as before, Chen refrained from calling Zhou a disciple. One day, during stifling summer heat, Chen awoke from a nap, his wife said to him, “Little Dragon spent the midday fanning you (while you slept), go ahead and teach some of your art to the boy.” Chen then felt an emotional attachment to Zhou. He told Zhou, his family name was Chen and he was a Shanxi person. Also that he was a disciple of Hua Shan Boxing. He would truthfully show him the basis of the boxing style but Zhou must not tell others the family secrets. He saw Zhou was sincere, then he “broke” the family secrets open, and showed Zhou Hua Shan Boxing, completely and openly. 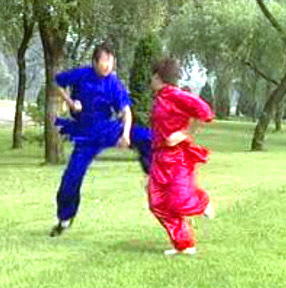 Zhou practiced the Hua Fist, assiduously obeying his instructor, without telling anyone. Chen was an unexpectedly brilliant coach, and taught his follower many skills. Zhou eventually obtained the “1984 Lun Zhou District Martial Arts Sports Meet” in boxing First Place in empty handed Boxing and Second Place in weapons. Hua Shan Style’s fundamental boxing forms is comprised of thirteen roads. Hua Shan has a 12 section form which synthesizes the important points of self defense, the transitions of Yin and Yang and a “Nine Word code” of practical Chin Nah transformations and counters. Hua Shan Boxing puts great emphasis on the use of : shoulder, back, arm, elbow, fist, claw, palm, hips, leg, knee and foot; 11 aspects of basic practice. It contains 32 arts, 72 methods and 62 exercises. The practice of Hua Boxing pays particular attention to the laws of the 12 traditional two-hour periods of the day; the movement of the “winds” (environmental factors), the human body’s Qi, Blood cycles, moving through their specific anatomical “roads” during practice. The Hua Shan boxing manual states, “Practice boxing like a boat floating on water, flowing along for a thousand miles, avoiding the barbaric style of practicing martial arts which leads to disorders of the body and body”. It’s Chin Nah methods and footwork is based on Taoism’s Yin Yang symbol, containing 36 techniques and 36 counters all together. Hua Shan also pays attention to using inch energy (cun jing), moving internal energy, and creating internal strength for fighting. Posted December 1, 2003 by Plum Staff. Comments are closed on this post, but you can trackback. Tagged with: Cai Gui Qin, Hua Mountain, Hua Quan, Hua Shan Quan.